When I started the 31 Days of Etsy Challenge, I planned from the beginning to have a giveaway to celebrate completing the challenge. I wanted to have the giveaway item be something that was created from the challenge that I really liked. I subtly hinted at this giveaway in a previous post. 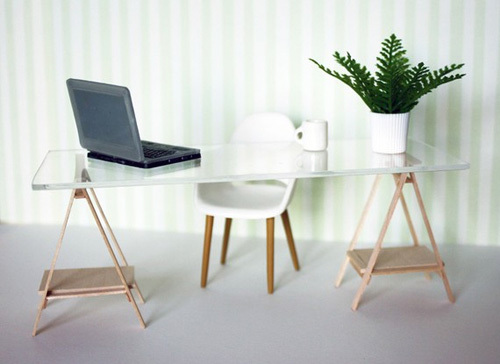 Win the Miniature Ikea Inspired VIKA Desk! This giveaway is opened worldwide and I will cover shipping costs. To be eligible for the giveaway, all you have to do is leave a comment on this blog post. Anyone who comments is automatically entered (unless its explicitly stated in your comment that you don’t want to be included in the giveaway). Also, don’t worry if your comment does not appear right away as I will have to approve new commenters first. If you want a second chance at entering, comment on this AmazingMinis’s Facebook Page wall post. Unfortunately, only those that “Like” the page can comment on the post. Fortunately, it is very easy to “Like” the page in order to post! If you’re already signed in to facebook, you can “Like” it from the Facebook panel on the right of this blog. Anyone who comments on the facebook post is also automatically entered. Linking to my blog or this blog post is not required, but it is very much appreciated if you do! Entries will close on Monday, February 28, at Noon (EST, -5GMT). All entries will be added to a spreadsheet and assigned a number and one winner will be chosen via random.org. Please be aware, if you win and I do not have a way to reach you or if I do not get a response in three days, you will be disqualified and I will draw again. If you don’t want to leave it up to chance, or if you want the 1:12 Scale Miniature VIKA Desk right now, you can purchase it from my Etsy shop with the prices newly reduced! 59 Responses to Miniature Ikea Inspired VIKA Desk Giveaway! *clears throat mildly* Then dashes to the start of the line to sign her name!!!! I hereby enter myself in this here contest! And, go me, I already linked to your blog today before knowing that you had posted this already. BOOYAH! I love IKEA furniture 1:1 and your miniature VIKA desk looks great!!!! Would you please count me in for your giveaway? Estoy renovando mi casita y me irian geniales esos preciosos muebles. Subo el aviso del sorteo a mi blog. Thank you all for the kind words… and good luck on the giveaway! love your blog and share in your obsession with all things miniature. thank you for doing your 31 days of etsy! My only worry is what will you giveaway if someone buys the desk? Wow, I would love to enter, thank you! I would love to be included in the give away! Thanks! Glad to know someone whom share the same obsession of miniatures as me. Would love to be included in your giveaway! Wonderful!! Please, count me in your giveaway. I stumbled across your blog from the pukipuki flikr pool, and am really enjoying it. Everything looks amazing! Me gustaría particiar en tu sorteo.Sorteas unas cosas preciosas.Me llevo tu sorteo a mi blog. Beautiful work what you have done there! Thanks again everyone for the wonderful comments. Thanks for the link love Jollie! oooohh!!! I would love to win this! XD Thanks for the opportunity! Love this give away !! Thanks for the wondeful offer! maravilloso!!!! ilusionada de participar en el sorteo, ahora subo el enlace a mi blog!!! gracias!!! Wounderfull Give away!Please count me in it!I love this table! Hola, soy una enamorada de Ikea, jejeje me gustaria participar en tu sorteo, lo subo a mi blog, gracias, besos. Wowww Ann…!! ¡¡Que maravilloso sorteo!! Que conjunto más moderno, parece de verdad… No conocía tu página y me está gustando mucho. Es muy original y moderna. Me encantaría participar en tu sorteo, y de paso aprovecho para invitarte a participar en el de mi blog. Aqui hay una seguidora a tu blog. por lo del concurso que alguien tenia el anlace te he conocido y que decirte que el trabajo es impresionante. Asi que quiero participar en el sorteo. Your IKEA furniture is beautiful, and i would love to be included in the give away. I chose my favorite pictures of your work, but please feel free to send me other photos if you would prefer to have those instead. Precioso regalo,muy diferente a todo lo que se suele ver, precioso, por favor me apuntas a tu sorteo??? muchas gracias y muchos besos. I am so glad to have found your blog thanks to A little More Minis blog. I have very recently ordered on your Etsy shop but did not you had a blog. Your giveaway is great, I like what you make a lot. Es realmente una preciosidad, me encantaría participar en el sorteo, gracias por ofrecer tan bonito regalo. Gracias por tu sorteo, estaré encantada de participar si me lo permites. How beautiful. In 1:1 i m addicted to ikea so why not in 1:12 haha! Wow! The table looks amazing! I´d like to take part of this wonderful giveaway! Es perfecto. Me encanta. Gracias por hacernos participes. Un saludo. I don´t know if it is still possible to enter in your giveway…but i love your furniture! Hi! How wonderful!! I like it a lot! I’m from Spain, can I participate? Thank you!! Me gustaria poder participar en el sorteo,el regalo es precioso,te anuncio en mi blog. Please count me in,i put your link in my blog ! Me encantaría participar en el sorteo, me parecen buenísimos sus trabajos. Enhorabuena por elllos y espero tener suerte. Wow! I love your give away.